The Potomac Art Therapy Association Welcomes Todd Stonnell, LPC, ATR-BC to the Art Therapist Spotlight! Todd Stonnell is a Board Certified Art Therapist and Licensed Professional Counselor in Richmond, Virginia. Todd graduated with his Master’s degree in Art Therapy from The George Washington University in 2013. During his time at GW Todd worked with many different populations within diverse settings; some of these experiences included: working with individuals receiving care for HIV/AIDS in a day treatment program; working at a residential school for youth and adolescents struggling with emotional and behavioral issues; as well as working with children in treatment for cancer in a treatment center in Chennai, India. Todd now offers art therapy and case management services at Williamsville Wellness Center, a residential treatment program for individuals attempting to seek recovery from alcohol, substance or gambling addiction. He also offers outpatient services for a wide array of clients, working specifically with adolescents and young adults, mainly focusing on LGBTQ+ concerns and/or life transitions. What influenced you to become an art therapist? I felt my calling for art therapy following several conversations with my High School art teacher, who challenged me to see the power of my own voice. For someone who struggled to fully express myself through words, I counted on something that allowed me to find an alternative language to better understand myself and to allow others deeper into my world. Through exploration of the power of my own voice, I wanted to step into a world where I could join others in their own journeys and continue to seek out answers together. Please describe your career background. What kinds of experience and training did you have? Which preparation do you think has helped you most? Following my undergraduate studies in psychology and art at Longwood University, I took some time to explore my interests and gain some experience in teaching and making my own artwork. I had a relatively eccentric work background prior to my entrance into the GWU Art Therapy program, first working as a costume character at Kings Dominion, followed by teaching science through shows and after school programs with Mad Science. I always say that these experiences challenged me to find new and creative ways to express myself, both with and without words, which has served me very well in my attempts to aid others in doing the same. During my studies at GWU, I interned at Whitman Walker Health at the Max Robinson Center, working with individuals living with HIV/AIDS; followed by my internship at the Regional Institute for Children and Adolescents (RICA) in Baltimore. I also worked at the GWU Counseling Center, where I worked with a young man living with autism; ultimately I worked with some of my peers at the Cancer Institute in Chennai, India, were we led an open art studio for youth and their parents, awaiting various treatments at the facility. I currently work at a residential treatment facility for addiction, offering both individual, family and group art therapy services. I welcome the patients to utilize art making to deepen their understanding of their addictions and struggles with impulse control. It is my aim to integrate mindfulness and components of the 12 Steps into the process for patients to gain insight and skills to promote a strong and maintained recovery. I balance this role with case management, assisting patients in creating aftercare plans, consisting of outpatient recovery support, sober living if necessary, and breakdown of resources to manage triggers and warning signs. As an art therapist, what part of your job is most satisfying? Most challenging? they carry this change over into their lives outside of these walls. The most challenging part of this work would hands down be the bounce back from burn out and how to balance life outside of the work itself. I find it important to consider my resilience and practice consistent self care. It is important to practice self-compassion for times when this practice is not as consistent as I would like it to be. Who would you say has been the most helpful in your career development? I feel like my colleagues, teachers, supervisors and family have been vital in helping me see my potential in my development. I have had many moments of “imposter syndrome,” and these individuals have challenged me to recognize the changes I am making and how I can continue to grow. What is art therapy to you? I feel like art therapy is the process of utilizing art making to get to know your personal language to better understand your deeper, inner workings. Through art making we are granted a safer passage into creative and meaningful parts of ourselves, to better heal and progress through our lives. The Potomac Art Therapy Association Welcomes Elizabeth Kim, MA, ATR-BC to the Art Therapist Spotlight! Elizabeth Kim is a Board Certified Art Therapist. Elizabeth graduated with her Master’s degree in art therapy from The George Washington University in 2013. Since then she has worked in a variety of community settings, gaining experience with a wide range of client populations of all ages and backgrounds, including Adolescents with Eating Disorders and Senior Citizens at a Wellness and Arts Program in Washington, DC. Her internships have included a rotation at Children’s Hospital, George Washington Hospital, Greenspring Erikson Retirement Community and the Banyan Center, a homeless women’s shelter in India. During Elizabeth’s employment at the Wellness and Arts Program in DC, she was invited to host the First Lady of South Korea after a visit from the Embassy of South Korea. The South Korean President and First Lady had both expressed their commitment to funding services for older adults with dementia and their families in South Korea, which was furthered supported after the First Lady of South Korea visit. The First Lady of South Korea was deeply touched with her interactions with one of Elizabeth’s participants, who reminisced his service in the Navy. While he was painting the participant sang “White Cliffs of Dover” which the First Lady of South Korea later researched, played with her team during her travels back to South Korea. Art has always been the constant and grounding force in my life. It was my mother who exposed me to the field of art therapy but I was in an undergraduate school that did not provide the training. After sometime in the workforce I felt a calling to pursue the career of art therapy and I am so glad I followed my heart and intuition. I received an undergraduate degree in organizational administration with a concentration in events management and focus in leadership. I then went to receive a Masters degree in art therapy at The George Washington University. As a student I interned in a retirement community, hospitals, trauma clinic and a rotation at a homeless women’s shelter in India. I previously worked at an independent, nonpartisan, nonprofit organization for climate conservation that provided me the administrative and logistical skills to manage my time and perform tasks in an efficient manner, experience that has helped me develop as an art therapist. I am currently the art therapist and arts center coordinator at the Goodwin House of Alexandria. I provide creative programs and oversight in a few residential activity groups. I oversee a 1st year GW art therapy intern as well as work in an interdisciplinary team that provides life enriching events and opportunities for residents. The most rewarding part of my work is witnessing my clients discovering new parts of themselves as well as revisiting past memories and experiences that have held significant experiences. As an art therapist connecting the past, present and future provides opportunities of healing and self-discovery. I have had inspiring, supportive mentors, teachers and supervisors. I am grateful for the clients who have allowed me to witness their journey and to teach me the many lessons needed to become an art therapist. Art Therapy is a creative process that provides individuals the opportunity to express, heal and understand various aspects of their life through art-making. 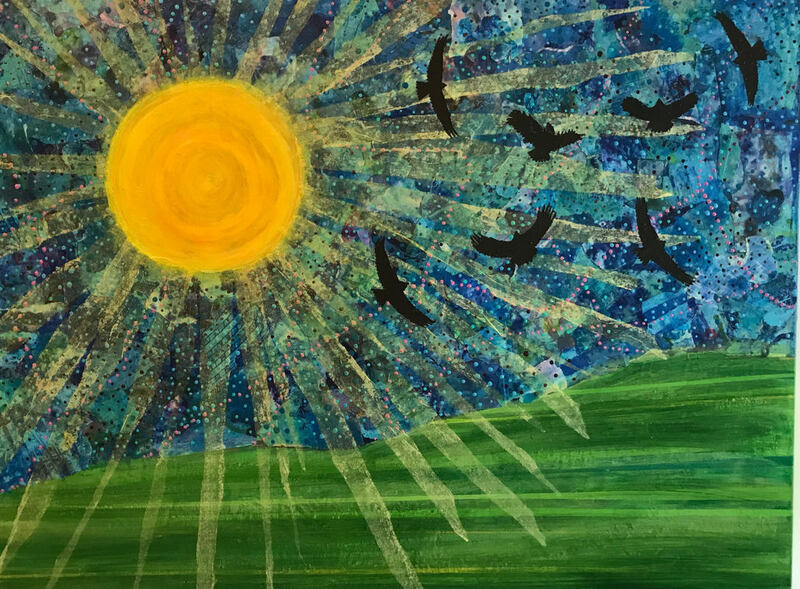 Art Therapy is a non-threatening way to connect and begin a client’s journey to their internal world. The Potomac Art Therapy Association Welcomes Hannah Wilson, LPC, ATR-BC to the Art Therapist Spotlight! Hannah Wilson is a licensed professional counselor and board certified art therapist. She is an associate at Your Soul Therapy, a private practice in Washington, DC. Hannah works from a holistic approach that combines psychotherapy, art therapy, sand tray therapy and training in multiple forms of energy healing to help clients access the underlying causes of symptoms as well as to access their deepest levels of strengths, wisdom, intuition and trust. Hannah supports clients in integrating all parts of themselves by practicing art therapy through the lens of trauma informed care, attachment theory, relational, strengths based and psycho-spiritual approaches. Hannah graduated with her masters degree in art therapy from The George Washington University in 2011. Since then she has worked in a variety of community settings, gaining experience with a wide range of client populations of all ages and backgrounds. Hannah has come to view her graduate degree as just the beginning and is committed to ongoing training, professional development, consultation and most importantly, self care. I have always used art making as a way to intuitively express, explore and process my emotions and life experiences. I also felt called to pursue a career as a helping professional. When I learned about art therapy it just clicked and felt like the perfect marriage of these two interests. I received an undergraduate degree in both fine arts and psychology from Alfred University and then went on to receive a Masters degree in art therapy at The George Washington University. As a student I interned in a hospital, school, and trauma clinic. I then worked as an art therapist in several hospitals as well as providing community based services. My experience in hospital settings allowed me to gain experience working with many different and diverse populations of adults and children in both medical and psychiatric care units. In these settings it was impossible for me to be an “expert” in every population that I worked with and therefore taught me the importance of attuning to each client’s internal experience in the present moment. Training and understanding of trauma therapy and trauma informed care provided an invaluable framework for responding to the client’s emotional and physical experience, no matter what the details of their specific life story are. I am currently an associate at Your Soul Therapy, a private practice in Washington, DC. I provide art therapy, psychotherapy, sand tray therapy, and energy work to adults as well as professional supervision. My clients often come to therapy experiencing anxiety, depression, feeling stuck in life, feeling unworthy, or desiring relationships/connections/career/life that are more authentic and meaningful. Many of my clients have tried other types of therapy before and are seeking a more holistic and in depth approach. The most rewarding part of my work is to witness when a client begins to notice and celebrate the positive changes, growth and healing that they have nurtured and created within themselves. I am grateful for many wonderful mentors, teachers and supervisors. I am most grateful to all of the clients I have worked with who are my greatest teachers and who have trusted me to do this work with them and be a part of their journeys. Art therapy is a language and a gateway that can allow the deepest parts of ourselves to speak, be expressed, be seen and understood in ways that are far more profound than words alone. Art therapy provides access to your body and soul’s deepest wisdom. The PATA Art Therapist Spotlight aims to recognize exceptional work by PATA members who go above and beyond in the communities in which they work and live as well as strives to highlight the wide ranging work that art therapists accomplish. PATA is so grateful for the numerous art therapists who have taken the time to share their experiences in support of the Art Therapist Spotlight. If you would like to nominate an art therapist for their extraordinary contributions to the field, or highlight your own contributions, please email your nomination to potomacarttherapyassociation@gmail.com. The Potomac Art Therapy Association Welcomes Martina E. Martin, LPC, ATR-BC to the Art Therapist Spotlight! Originally from Pittsburgh, Pennsylvania, Martina E. Martin received a Bachelor of Arts in Political Science and a Master of Divinity from Howard University in 2002 and 2007 respectively. From as far back as she can remember, art has always been her secret getaway—her spiritual retreat. Thus, in order to gain further insight into its therapeutic potential, she pursued and attained a Master of Arts in Art Therapy from George Washington University in 2011. As a Board Certified Art Therapist and Licensed Professional Counselor, she currently serves as a full-time Psychotherapist at Whitman-Walker Health and operates a small private practice in the Woodley Park neighborhood of Washington, DC. Martina has conducted a countless number of expressive arts workshops and retreats with schools, government agencies, community and faith-based organizations and churches for individuals of all ages and abilities along the east coast. I was inspired to become an art therapist during my second year in seminary. I did not feel called to pastor a church, but was interested in the ways in which spirituality can be helpful and harmful to a person’s development and mental health. Art has always been an important part of my life and my own healing process, so integrating the two: art and spirituality, within the context of mental health, led me directly to the field of art therapy. I was not a traditional art therapy student. I did not major in psychology or art in undergrad, and I only took one art class then because I was desperately in search of a “real job.” I came to the art therapy field after receiving a B.A. in political science in undergrad and an M.Div. in religious studies in grad school. Interestingly enough, both fields greatly prepared me for my work. For example, when doing art therapy with marginalized populations, understanding how political systems can empower or disempower certain groups has been invaluable. Similarly, because of my background in pastoral care, I am sensitive to the needs of those clients who wish to process issues that are of a spiritual, religious, or existential nature. I currently work at Whitman-Walker Health which is a community health center that seeks to meet the needs of marginalized populations in Washington, DC. Whitman-Walker Health specializes in providing culturally competent care to individual impacted by HIV/AIDS and members of the LGBTQ community. As a full-time Psychotherapist in the Department of Behavioral Health, I offer individual and group art therapy and counseling services to youth and adult clients alike. I also provide in-house training for staff on topics ranging from compassion fatigue to racialized trauma. In addition to my work at Whitman-Walker Health, I also operate a small private practice in the Woodley Park neighborhood of Washington, DC. The most satisfying part of my job is journeying with my clients as they do the heavy lifting to better themselves. The most challenging part of my job is watching my clients take flight, knowing that after all of our hard work together, there will come a time when they must fly alone. Over the years, I have embraced my role as a planter and a waterer and have learned to mourn the fact that I won’t always get to see the harvest come in. I am extremely grateful to work at an organization that has some of the most dedicated, experienced clinicians in the DC area. Many of my colleagues are highly sought after specialists who love what they do, and pour their all into the clients we serve. At every stage in my career, from seeking licensure, to opening a private practice, I have had the very best role models, mentors and friends. Art therapy helps people process things they can’t find words for. As an artist-therapist who has used the creative process throughout my life to express myself and give meaning to my joy and angst, it is the sum total of all that I was put on earth to do! Art heals. The Potomac Art Therapy Association Welcomes Tamara Galinsky, MA, ATR-BC, LPC, LCPAT to the Art Therapist Spotlight! All my life, I’ve used art as a way to express and process emotion, but it took me some years to come into my professional identity, so art therapy is actually my second career. In my late 20s, I quit my (prestigious, high-paying, and health insurance-providing, but also soul-crushing) job at a non-profit organization, and was temporarily working as a landscaper, designing and planting flower gardens. I learned so much about myself during that time, and as a result, my professional goals and aspirations slowly began to come into focus. I woke up on the morning of my 30th birthday and announced that I was meant to be an art therapist. My background is in women’s health and clinical research, both of which dovetail nicely with my art therapy and trauma training and help inform the work that I do today. In my practice, I specialize in issues pertaining to sexuality and intimate relationships. While people of all genders and sexual orientations are welcome, I am uniquely equipped to work with members of the LGBTQ, Kink, and Polyamorous communities. Hands down, it’s most satisfying to watch my clients become more self aware, happier, and generally more fulfilled in their lives. My clients put a tremendous amount of trust in me to help them reach their goals, and it is truly wonderful to see all of their hard work pay off. The most challenging part is the vicarious traumatization that comes as a result of hearing and holding clients’ stories. Self-care is essential! Generally speaking, networking with other art therapists has been the most helpful in my career development, but also the most enjoyable. I love attending conferences, meeting other art therapists, and hearing more about what my colleagues are doing professionally. I will also always be grateful to my first supervisor, Rebecca Wilkinson. She has always been one of my biggest cheerleaders, and as a mentor, she helped me hone valuable clinical assessment skills and develop trust in myself as a therapist. Art therapy is magic! It never ceases to amaze me how the art is able to help clients unlock, express, and understand previously mysterious parts of themselves. Is there anything you would like to see offered through PATA in terms of professional development, continuing education or expanding your local art therapy community? I would love to see more workshops and other continuing education opportunities that are focused on romantic relationships and healthy human sexuality. The Potomac Art Therapy Association Welcomes Lauren Yoder, LPC, ATR-BC to the Art Therapist Spotlight! Lauren Yoder, LPC, ATR-BC is a Licensed Professional Counselor and Board Certified Art Therapist. Lauren is from Cumberland, MD, a small town in Western Maryland. At University of Maryland, Lauren was introduced to Art Therapy through a workshop flyer, and from there pursued a BA in psychology. She attended The George Washington University, where she received the Alexandria Partnership Fellowship and received an MA in Art Therapy. Lauren has worked with various populations all across the age spectrum. She currently works for the City of Alexandria's Youth and Family team, and is the Owner of Arts and Healing, LLC. I initially went to University of Maryland to study criminal justice. I had this vision of one day being Clarice Starling from Silence of the Lambs. I quickly discovered that was not the career path for me. As I was leaving one of my painful classes in criminal law, I saw this flyer for an Art Therapy workshop being held at Catholic University. I have no idea why this flyer was at this place, at this time, but it forever changed my life. I started out my career working in home-based, with young children diagnosed with Autism Spectrum Disorder. I then transitioned to the opposite end of the age spectrum, and co-facilitated a creative arts day program for adults with Alzheimer's and Dementia, located in a retirement home. I began working in a group private practice to supplement this part time job, which eventually evolved into opening my own practice in October 2015, Arts and Healing, LLC. Also in 2015, I began working full time for the City of Alexandria's Youth and Family team. I recently became trained in EMDR and TF-CBT. The majority of my work is trauma related, and having training in these different areas is extremely invaluable. I opened my practice in October 2015, which was a new learning curve for me. I operate all aspects of the practice, even insurance billing. I service primarily adults in this practice, and I have a special interest in military service members and their families. I accept Tricare, Blue Cross and Blue Shield, Anthem, Aetna, and Magellan. I began working full time for the City of Alexandria in 2015. In this position, I have an office located at Minnie Howard High School, and I service youth in the 9th grade. I also have an office at our local Community Services Board. My position with the city affords me the opportunity to work with juvenile detention, shelter, court services, community wrap around, and across various community based services. I also sit on the Attendance Panel, which meets twice monthly at court services, and we make determinations for youth who are chronically truant from school. I am so grateful to be a part of so many individual's journey through healing. It is so satisfying to be able to witness a person's capacity for healing. Our clients have such sacred, deeply personal stories to tell, and it is so amazing to be a part of that for someone. I find that the most challenging aspect of the work is terminations. This work is so incredibly personal and intimate. I believe in being as authentically human as possible in my work, and that does at times mean developing strong, caring connections with the people I work with. I am not sure if it is talked about enough in the field, or perhaps it is taboo. I find the termination process can be a wonderful opportunity to practice healthy goodbyes, but we all know it doesn't always happen this way! I have had so many wonderful teachers and helpers in my career development. I was so fortunate to have a number of talented, supportive, and inspiring teachers at The George Washington University. Mary Ellen Ruff, who supervised me for years in school and in my licensure, has been such a wonderful support and teacher. I have also picked up a number of friends, colleagues and coworkers, who are invaluable resources for learning, expanding, and supporting one another. My parents have been incredible through this journey; they are always so supportive, encouraging, hardworking, and have set wonderful examples for my sister and me. My sister is a constant creative support, with a good business sense. She is also a business owner, so it is always helpful to bounce ideas off of one another. And of course, my husband Jared, who has been by my side through every part of my journey. When I decided to dive into business ownership, he was so supportive, and didn't question the idea one bit! Art Therapy is the process of using art materials to express what cannot be expressed through words alone. It allows a person to tap into the unheard parts of the body, mind, and soul, and bring it to life in a safe, nonjudgmental, and clear way. Art allows people to make meaning of their experiences, and then safely communicate that with others. The Potomac Art Therapy Association Welcomes Adele Stuckey, LPC ATR-BC to the Art Therapist Spotlight! Adele Stuckey, LPC, ATR-BC, CZT is a Board Certified Art Therapist, Licensed Professional Counselor and Certified Zentangle Teacher. After graduating from undergraduate with a B.S. in psychology and minor in art, she completed a Master of Arts in Art Therapy from George Washington University. She has worked with individuals of all ages in both school-based settings and psychiatric hospitalization programs. She currently works with children at a non-public school in Washington, D.C. and teens and adults at her private practice in Alexandria, VA.
Adele believes that a regular creative practice is essential in supporting a healthy, well-balanced life. Her favorite forms of art making include Zentangle drawing, altered books, watercolor painting, and ceramics. You can learn more about her art therapy practice by visiting her website at http://www.alexandriaarttherapy.com/. Art has always been a part of my life in some form or another. Making art served as a cathartic outlet and a way to process my experiences in a tangible way. Growing up, I was also very interested in the field of psychology and the way the mind worked; so when I discovered the field of art therapy in high school, I knew it was the perfect marriage of my interests. After completing my Bachelors of Science in Psychology and minor in art, I began the GWU Art Therapy program. During my art therapy training, I completed internships at a public charter school and an inpatient psychiatric hospital. My first years out of the graduate program, I worked as the art therapist at a psychiatric hospital for individuals of all ages. I provided art therapy groups to support the treatment and recovery for individuals seeking treatment for mood disorders, psychiatric disorders, eating disorders, self-harming behavior, and behavioral needs. My work at the hospital enabled me to grow as an art therapist and see the healing power of art first hand. I am currently the art therapist at a non-public school in DC, working with children grades K-8. I provide individual and group art therapy as a nonverbal outlet for thoughts and feelings, to promote healthy social relationships, and support their well being in a positive learning environment. Additionally, I work with teens and adults seeking support for anxiety, depression, and self-harming behavior at my private practice in Alexandria, VA. The most satisfying part of being an art therapist is being witness to change and watching clients tap into a side of themselves they did not think was accessible. So many people believe they do not have the skills to participate in art therapy; I love seeing their perspective shift as they use art to express themselves. A challenging aspect of the field is the ongoing need for advocacy and education about art therapy and art therapy licensure. I have worked with so many wonderful professors at GWU and supervisors throughout my training and career, including Lynne Harris, MA, LPC, ATR and Mary Ellen Ruff, LPC, ATR-BC who have supported me immensely and influenced my growth as an art therapist. I would also like to acknowledge Chelsea Kennedy and Lauren Persky who introduced me to the world of Zentangle. Art therapy provides the opportunity to express what is difficult or impossible to say with words. Everyone has the capacity for creativity and communication; making art opens up the doors to those thoughts, feelings, and experiences that can be difficult to access. Making art has the ability to be cathartic, powerful, transformative, and healing. The Potomac Art Therapy Association Welcomes Mary Ellen Ruff, LPC, ATR-BC to the Art Therapist Spotlight! ​I received my Master of Science in Art Therapy from Eastern Virginia Medical School in 1996 and have been practicing art therapy ever since. Prior to that, I attended Saint Louis University on a swimming scholarship and studied psychology and studio art. I grew up in Alexandria and returned after graduate school because I love this community and wanted to be close to my family. I gravitate towards mixed media pieces and collage when I’m making art. I like using my hands and being close to the materials I’m using. I love learning new techniques and media and would love to learn more about printmaking techniques. I have always loved making art, being creative and grew up in a service-oriented family. My interest in psychology and helping professions led me to figure out a way to marry my interests and fortunately, art therapy was there. I have used creative journaling since high school which in hindsight was my own way of processing the things that were going on in my life. It just seemed like a perfect fit for me to pursue as a career. I’m also a big fan of biographies and reading the biography of Jackson Pollack during my senior year of high school piqued my curiosity about creativity and madness. I’ve had several jobs and experiences with different clinical populations. The most significant early work experience I had was at the Psychiatric Institute of Washington in their Center for Post-traumatic and Dissociative Disorders. The team I was fortunate to be a part of was incredibly experienced in working with trauma, provided an amazing training ground and very much valued art therapy which allowed me to really stretch my creative muscles in providing art therapy directives to the patients that enabled them to put images to experiences where words simply failed. Since that time, I’ve primarily been involved in substance abuse programs (intensive outpatient treatment for adolescents, Family Drug Court, and court-involved adolescents). I became interested in substance abuse treatment in high school when I had a close friend who went through it. I became really curious and wanted so much to understand what he was experiencing in his addiction and then recovery. We’re still friends and he’s still in recovery and I still share about him when I teach as an early influence in my career interests. I think private practice has been both challenging and rewarding in so many ways. I think too many young therapists dream of the idealized private practice world, and its just not a role I recommend taking on until you’ve really had a range of clinical experiences and are really prepared to work independently. It takes a long time to develop the skills needed to manage a caseload in a responsible and clinically sound manner. I currently have 3 jobs. I’ve patched together jobs that allow me to do the things I love most about being an art therapist. I teach at George Washington University in their Art Therapy program and am involved in the Art Therapy Clinic which is student-run and a wonderful resource for the community. Teaching is a real passion and I’ve loved being part of the GW Art Therapy community. I have a private practice where I see adolescents and adults for individual therapy. And I run a substance abuse program for the City of Alexandria that serves adolescents involved with the Court for various reasons. I love that my work is varied and always interesting and I never have the same day twice. The most satisfying part of my work is seeing change happen, seeing clients gain insight, and seeing growth in ways clients don’t always think is possible. The most challenging thing currently is working with adolescents who don’t have family support, making their efforts at change that much more difficult for them. I also find my continuous growth as a therapist and individual incredibly gratifying. Who would you say has been the most help in your career? I would have to go back to graduate school for this and the professors who had a significant impact on my development as an art therapist- Matthew Bernier, Sarah Deaver, Jim Consoli and Trudy Rauch. Their words still echo in my head as I practice, as I teach and I know I wouldn’t be the therapist or teacher I am today if not for their influence on me. What is art therapy to you? What do you think is the power of art therapy? I think the power of art therapy is in experiencing it- creating artwork as part of a change process, witnessing others in the midst of their own change processes and knowing that art is always there in even the smallest ways. I’ve been going through cancer treatment for the past few months and art was a huge part of dealing with the crisis of being diagnosed. Treatment has really taken up so much energy that I haven’t had as much to invest in art-making, but I’ve started back in small ways creating art, playing with materials, and its so interesting to be reminded of the power of even the smallest creation. The Potomac Art Therapy Association Welcomes Ruth Stenstrom, ATR-BC to the Art Therapist Spotlight! In 1989 I started the CASSA Arts Workshop, a therapeutic arts program located at Clean & Sober Streets residential recovery program where I have worked with over 1800 men and women in the past 25 years. I have also worked as an interdisciplinary artist, an arts educator. I also worked as an organizer and co-director of a community based P Street Paperworks silkscreen center and the Local 1734 Gallery where I was responsible for financial management, silkscreen artwork and classes and coordination of exhibits featuring local artists. At WGTB-FM I hosted public affairs and Critique, a weekly show about the arts. My paintings and videoart have been shown nationally and internationally. As Chair of the School Without Walls SHS art department for 20 years, I expanded the program to include Video Yearbook, Computer Graphics, Ceramics and Twentieth Century Art History. As a part of its philosophy of learning in the community, I provided numerous opportunities for my students to take field trips to museums, exhibits and seminars with local artists, a process I continue today with bi-weekly museum trips at CASSA. I am a Board Certified, Registered Art Therapist, graduating from GWU’s graduate art therapy program in 1996. 1. What influenced you to become an art therapist? I began my art program at Clean & Sober Streets after working with working with women at the DC Jail the DCCAH Arts-in-Prison program. In 1988 I met Harold Moss, an activist for the homeless, who was asking for donations of artwork for the newly created Federal City Shelter. He said “Art saves lives.” Looking at his own beautiful oil paintings, I suddenly got the idea that I could write a grant to start an arts workshop there. When I got my grant I was directed to the new drug and alcohol recovery program which had been given a wing in the shelter for free long term residential treatment. As I worked with program participants I began to realize the therapeutic impact of art , but I also saw that I needed more training to better serve my clients. Serendipitously I was on the faculty of School Without Walls High School which was located directly across the street from GWU’s art therapy building. After my first night class, Survey of Art Therapy with Brenda Barthols I was hooked. 2. Please describe your career background. What kinds of experience and training did you have? Which preparation do you think has helped you most? I began my professional career as an artist in an atypical, circuitous manner..I had very little formal arts training, majoring in history in college. In the 1970’s after quitting my government job and traveling in Europe for a year, I joined with a group of mostly women artists to start P Street Paperworks silkscreening center. We had a philosophy of workplace democracy and skill-sharing which was shared by a network of local DC alternative businesses. In 1977 we established the Local 1734 Arts Collective & Gallery near Dupont Circle where we shared artistic projected ideas, curated exhibits and sponsored local arts events. Being a part of a women’s collective at a time when I also participated in a women’s conscious raising group and as host of public affairs, news and the Critique arts program at WGTB radio station gave me a political foundation for working in community arts. My work with silkscreening and teaching small classes in this media served to establish my credentials to teach part-time at the Duke Ellington School of the Arts. I obtained an MA in Studio Art from NYU with studies in Venice, Italy and New York. My experiences attracted me to the learning in the community, hands-on philosophy of School Without Walls where I served as Art Department Chair for 20 years. Having shared responsibility, experience with consensus decision-making and working with community based not-for-profit organizations served as a great foundation for developing a therapeutic arts program at Clean & Sober Streets. My graduate art therapy work at GWU (1992-6) helped to consolidate all of these influences with my work. I direct the CASSA Arts Workshop, a therapeutic art program for residents of Clean & Sober Streets, a long-term residential substance abuse recovery program for men and women in Washington, DC. CASSA offers small group and individual art therapy sessions, a supervised open art workshop environment with opportunities to explore a variety of media from drawing, painting on canvas, fused glass work, mixed media works, fiber arts, photography, computer graphics and garage band music composition. The majority of our clients are men and women from minority groups. Many have other related problems including mental disorders and trauma, family histories of alcoholism and drug abuse, experiences with incarceration, poverty, homelessness, and/or physical disabilities. Our clients range from 20-75 years old. I write grants to support my program and CASSA has been a site for 12 GWU graduate art therapy interns over the past 11 years. 4. As an art therapist, what part of your job is most satisfying? most challenging? It is most satisfying to work with our clients, especially those who find a connection with art and express how it has helped with their recovery. I am lucky that I am able to witness people on the cusp of changing their lives, and with time I encounter many who return for AA/NA meetings and have managed to transform themselves into success stories. I enjoy working with the open studio, positive psychological approach as if fits the needs of our clientele for flexibility, choice and self-empowerment. It also helps to satisfy my need to contribute to meaningful social change and to make a contribution to the local community. It is very rewarding to work with GWU interns who have been exceptionally talented and have helped me to stay connected with a younger generation and have challenged me to hone my skills as a therapist/teacher. What has been recently more challenging is the process of expanding our outreach to work with a more transient clientele and greater numbers of people. The biggest challenge as the director of an organization that has to fund raise to stay solvent is the amount of time spent on administrative details, documenting work and grant-writing. .The danger is letting administrative tasks take up all of your time and energy, like kudzu, encroaching on your creative self. 5. Who would you say has been the most help in your career? As I look back there is not one person who stands out as the most help—there have been too many to mention. These include My networks with other artists who have served as role models, shared opportunities, words of encouragement, inspired ideas and shared technical skills, the support of my art therapy teachers and supervisors, and the support of the DC Commission on the Arts & Humanities who have funded my program for nearly 26 years. I would also credit the founders of Clean & Sober Streets, Marsh Ward and Julia Lightfoot who gave me the opportunity, space and creative freedom to design the CASSA Arts Workshop and who have consistently supported my work with them. A life-changing, politicizing experience was being introduced to DC as a part of a summer work-study Y seminar at age 19 in 1966 at the heady time of the War on Poverty and the War in Viet Nam. Andy Maguire, the director of our college student group, went on to become a congressman from New Jersey. He inspired me with his persevering ability to get an ambitious roster speakers and venues for our program, to learn from direct sources. In processing the experience, I realized his ability to create a challenging group dynamic was not only due to his high standards of excellence, but also that he held each of us in such high esteem that we regarded each other in the same way. He showed me the transforming power of being a part of a great group, something which I seek to emulate in my work. As a result I became fascinated with DC and city problems, and returned to DC to work when I finished college. 6. What is art therapy to you? What do you think is the power of art therapy? The field of art therapy is very nurturing to the artistic spirit and the process of self-actualization. I like its diverse approaches, as myriad as the many media and practitioners of different styles and emotional, psychological, intellectual, and spiritual dimensions. I like the power of art to help people to think outside of the box and to connect with others. In my work with clients who have lost years of their lives and missed educational opportunities, art-as-art therapy offers chances for self-actualization, shared aesthetic experiences, and growth, as well as ways for the mind to self sooth and heal. I keep trying to investigate the notion of “Art Saves Lives.” I think the ability to find an outlet to express oneself creatively can counteract self-destruction and provide a healing force. 7. Is there anything you would like to see through PATA in expanding local art therapy community? As an inter-disciplinary artist I would like to see more cross-fertilization and connection other forms of expressive art therapy—music, dance, poetry, theatre. I was very fortunate to be chosen as one of the authors in Carol Cox and Peggy Heller’s anthology Portrait of the Artist as Poet. In the 90’s I was fortunate to work and travel with an international group of artists doing art installations and video documentation for five performance works with Norm Davis in Germany, Prague, Montreal, Boston, San Francisco, New Orleans, DC and New York. In 2011 I was selected as a Media Arts Fellow by the DC Commission on the Arts & Humanities for my videoart. Examples of my work can by seen on my website: www.ruthstenstrom.com. The Potomac Art Therapy Association Welcomes Jackie Jones, MEd, MA, ATR to the Art Therapist Spotlight! Jackie Jones, MEd, MA, ATR is an Art Therapist working to address the invisible wounds of war. Jackie earned her Master of Education with a focus on Art Education from the University of Maryland, College Park in 2008. Her action research focused on teaching strategies to increase the self-efficacy of middle school students. After graduation she taught as an art educator in Fairfax County Public Schools. Jackie returned to school and earned her Master of Arts in Art Therapy from the George Washington University in 2013 to further explore how art could be used therapeutically. ​While at GW, she gained experience providing art therapy to pediatric oncology and hematology patients, youth with emotional disabilities, and adults with persistent mental health conditions. Art has always been my primary source of self-expression, processing, and healing, and I’ve always been fascinated by the intersection of art and psychology. Two events in particular solidified my pursuit of becoming an art therapist: 1) Between undergrad and my graduate education in art education I volunteered with homeless children and mothers in a favela in Brazil. I approached the work with the lens of an art educator, and when I left, upon reflection I wished that I had been equipped to have provided art therapy. 2) As an art educator I would notice “red flags” in students’ artwork but I wasn’t in an appropriate position to therapeutically process the work with students. I knew I would find my work more fulfilling if I could work with people beyond the creation of their work and into the therapeutic realm. I double majored in art and education as an undergraduate at the University of Maryland, College Park. I earned my Master of Education with a focus on Art Education from the University of Maryland, College Park in 2008. I taught as an Art Specialist in Fairfax County Public Schools for three years before I returned to school to pursue my art therapy degree. I earned my Master of Arts in Art Therapy from George Washington University in 2013. Upon graduation, I established the art therapy program at Intrepid Spirit One, NICoE satellite at Fort Belvoir Community Hospital. Outside of the US, I studied art in Italy as a high schooler and Greece as an undergraduate, and I provided service through art to people without homes in Brazil and India. My education, career, and international experiences with art and service all influence my approach to art therapy. I am currently the Creative Arts Therapist at Intrepid Spirit One, NICoE satellite at Fort Belvoir Community Hospital. I provide art therapy to active duty service members in treatment for traumatic brain injury and psychological health conditions, such as post traumatic stress. Clinically, I provide group and individual art therapy, mainly to service members but sometimes to families as well. I work on a team with providers of various disciplines within a rehabilitation clinic that utilizes an interdisciplinary approach to provide individualized patient-centered care. Administratively I run all aspects of the art therapy program, from curriculum development, schedule management, supply ordering, etc. In addition to running individual-based and various types of group-based art therapy for clients, I have been collaborating with organizations such as the NEA and Drexel University’s Ph.D program in Creative Arts Therapies to investigate the use of art therapy with service members with invisible injuries, as well as working with local organizations such as The Art League, The 296 Project, and the Armed Services Arts Partnership who provide community-based arts engagement opportunities for veterans. I find it very rewarding to be able to provide an opportunity for service members to use art making to go beneath the surface to express, explore, and process that for which they may not have the words or otherwise be able to externalize and examine. It is extremely rewarding when patients find hope for their overall recovery through art therapy. The most challenging aspects of my job are meeting the demand for art therapy services and working to address past trauma while daily lives continue to present their own new challenges. I feel very fortunate that the National Endowment for the Arts was willing to financially support my pilot program and then continued work, and that the Intrepid Spirit One, NICoE satellite at Fort Belvoir Community Hospital welcomed and supported me as I established an art therapy component and then permanently included me as an integral part of the interdisciplinary care offered at the clinic. I also feel fortunate to have worked with Melissa Walker as my supervisor, mentor, and then colleague throughout the process. Art therapy is using art making and the creative process for genuine self-expression which ultimately leads to healing and improved overall wellbeing. I think that the power of art therapy lies in art’s ability to authentically mirror to ourselves parts of ourselves we would otherwise not be (at all or as) in touch with. I think PATA is doing a wonderful job growing their outreach and programming. -Nancy Schoebel Scholarship Award, presented in September 2012 by PATA for excellence in graduate level art therapy writing. -GW Graduate Art Therapy Program Kwiatkowska Award for use on research, presented Spring 2012. 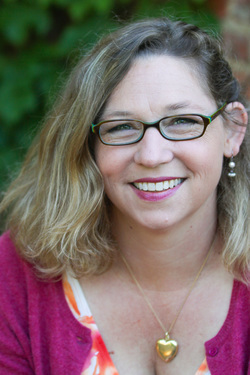 Jennifer Baldwin, MA, ATR-BC, LCPAT to the Art Therapist Spotlight! The profession of art therapy has brought me down many paths over the last 18 years since I graduated from the art therapy graduate program at The George Washington University in 1997. All of these paths have culminated in a fulfilling identity as an art therapist. As a native Northern Virginian, I decided to stay in the D.C. metro area and have worked in several outstanding facilities over the years. Following a successful internship working with pediatric oncology/hematology patients at the Lombardi Cancer Center, I was hired on and started my first job as a full-fledged art therapist. I also worked establishing art therapy services with ages K-6 at a newly built special education center within the Fairfax County Public School system. My experience working with the special education population led me ultimately to my current position as a clinical art therapist for a private therapeutic day school, Accotink Academy, where I have provided individual and group art therapy services for students in grades K-12 with severe learning and emotional disabilities for almost 10 years. During my early career as a clinical art therapist in the schools, I was experiencing a frustration with art therapy services not being recognized as a viable therapeutic modality for children with disabilities and therefore being dropped from the students’ Individualized Education Plan (IEP). Like several of my colleagues, I volunteered to be on the AATA Governmental Affairs committee and joined a group of great men and women who worked to advocate in our Nation’s Capital for the recognition of the importance of art therapy services. Much has changed over the years and art therapy has grown in legitimacy and stature and I have recently begun to work privately with children and adolescents. Lastly, I joined the adjunct faculty at The George Washington University, Graduate Art Therapy program in 2010 and have thoroughly enjoyed teaching the course, Art therapy with Adolescents, and serving as an on-campus supervisor to graduate students. From a young age I used art as a form of self-expression and understood that I felt better when I was creating art. I am also a very compassionate person and found myself looking out for others, caring what happens to people, helping people feel better about their circumstances. Art and Therapy, thus Art Therapy, seemed to be the perfect vocation for me. I started out my career working with children with medical illnesses. I learned so much about myself as a novice art therapist during this time as I was dealing with grief and loss and life and death scenarios. I developed some strong relationships with my co-workers, learning how important a team approach can be for clients, as well as, greatly valued the strength and compassion that my supervisor, Tracy Councill, modeled during those years. I went on to work in both private and public school settings as a clinical art therapist working with children with severe learning and behavioral disabilities. Currently I am working part-time at a therapeutic day school where I provide individual art therapy services to children and adolescents with sever learning and emotional disabilities and part-time in private practice providing individual art therapy services to children and adolescents with a range of needs and disabilities. I am also adjunct faculty at The George Washington University where I have been teaching Art Therapy with Adolescents and Practicum class for on-campus supervision. The part that is most satisfying is when I meet with a new client, someone out in the community, or a friend and while speaking to them about art therapy and the potential for healing through creativity, it sparks understanding and they get the value of the work. The part that is most challenging is the ongoing issues around licensure for art therapists. I would say the friends and now colleagues that I met in graduate school. We continue to support each other, no matter the distance, through the many challenges of life and career. 6. What is art therapy to you? Art therapy is any creative process that brings healing, thoughts of potential, and feelings of understanding when life, issues, circumstances cause confusion and difficulty coping. Art making has the power to cut straight through the toughest attitudes and bring relief and change. 7. Is there anything you would like to see through PATA in expanding local art therapy community? Continued work on securing licensure for art therapists in VA.
Lindsey Vance, ATR-BC, LPC to the Art Therapist Spotlight! Lindsey Vance grew up in the Midwest, living in both Wisconsin and Minnesota throughout her youth. Vance attended The University of Maryland, attaining dual Bachelor of Arts degrees in Fine Art and Psychology. Vance received a Master of Arts in Art Therapy from The George Washington University. Vance is a nationally Board Certified Registered Art Therapist (ATR-BC), Licensed Professional Counselor (LPC), and serves on the American Art Therapy Association (AATA) Multicultural and Finance Committees. Vance has worked in an array of community mental health settings as a Mental Health Counselor and Art Therapist, including: medical, jail diversion, chronically homeless, school-based settings, and with at-risk youth. Vance continues to work with treatment teams, groups, families and individuals. Vance’s professional interest and personal expertise focuses on creating art and providing workshops to her community and globally to effect social change. Through various mediums and some unconventional methods Vance uses her art to heal, to express, and to give back. Currently Vance is a Senior Program Manager and Art Therapist at Project Create in Washington, D.C.. Vance also is an adjunct professor for Bowie State University and Contract Therapist for Transitional Housing Corporation. In addition, Vance provides therapy, supervises, consults, and trains other professionals in the field. I was inspired at an early age to use art as helping tool for patients in the hospital, not knowing anything about art therapy. My mother was very ill and I spent a lot of time decorating nurse’s stations and creating art with and for patients who did not appear to have much support or family. As my love for art grew, so did my desire to help others. I began to research a way to do both as a career and stumbled upon art therapy. During high school I developed a passion for advocating for those who often appeared voiceless and my desire to support and make change grew. I would use art as a vehicle to disseminate information and calm my spirit after recognizing the ills of injustice. After further exploration of art, social justice, and helping professions, I knew art therapy was definitely the career for me. I received dual bachelor degrees in Studio Art and Psychology from the University of Maryland, where I honed my skills of various art mediums and delved into understanding the etiology and psychology of people. I proceeded to pursue and obtain my master of arts in Art Therapy from The George Washington University, where I had five different practicums, learning to serve various populations. Upon graduating from GWU in 2010, I began my career contracting art therapy services for a public charter school providing art therapy for middle and high school children suffering with emotional and behavioral disorders. This fueled my passion for working with children and adolescents, however I went on to work at Green Door as a case manager on a jail diversion team. There I worked with adults with chronic, severe and persistent mental illness, and substance abuse. This experience furthered my clinical skills and affirmed the true healing nature of art. After proposing and starting an art therapy group with adults facing such emotional turmoil, I became determined to offer more services, thus switching to a day treatment program, which allowed for more trauma-informed groups and greater opportunity to use art therapy. When an opportunity arose to return back to Miriam’s Kitchen, which was one of my internship placements during my graduate training, I took advantage. Remembering the impact of open studio art therapy on the lives of individuals experiencing homelessness continued to tap into the advocate for social justice within me. With their new mission to end chronic homelessness in the District of Columbia, I was compelled to play a part. I am now taking the abundance of clinical skill, passion, and dedication learned from my experiences to a new organization; Project Create, which is devoted to promoting positive development in children, youth and families experiencing poverty and homelessness. I have several jobs including adjunct professor, contract family therapist, artist, consultant, and caring for my family. For the past 2 years I have been the Senior Art Therapist at Miriam’s Kitchen full time in addition to the plethora of other ventures I find myself in. The most satisfying part of being an art therapist is the ability to allow creativity to be a healer, rebuilder, and a comfort for people who are suffering. I have witnessed people, at what many would consider the lowest point regain control over their lives after participating in art therapy. The most challenging part of being an art therapist is the lack of understanding and acceptance of the field. On many occasions I have had to advocate on the behalf of myself and the profession, to prove art therapy’s competency and legitimacy as a clinical profession. What I have found however, people are eager to learn and mostly open to hearing proposals. Gwendolyn Short and many other members of AATA’s multicultural committee took me under their wing during graduate school and encouraged me to step up into leadership roles within the association way sooner than I ever thought I should. Gwen particularly answered questions, provided constructive feedback, and offered emotional support and guidance as a young therapist entering the field. Art therapy is a unique opportunity and alternative modality to explore and process life’s turmoil through creativity and expression. It reaches beyond the surface and allows unconscious and conscious feelings, thoughts, and emotions time to intermingle, thus developing a better understanding of self. The power of art therapy lies in the innate ability and desire humans have to express the complicated inner workings of our minds and psyche. Art fills voids and promotes communication allowing for renewed understanding. I would like to see PATA advocate and work to educate other professions and groups about the importance of art therapy. I would like to see the continued effort to gain a DC licensure so that art therapist can find viable and sustainable employment as art therapist. I served as chairperson of AATA Multicultural Committee for 3 years and I am currently apart of the AATA website taskforce and a member of the Finance Committee. Jordan Potash, PhD, ATR-BC, REAT, LCPAT, LCAT to the Art Therapist Spotlight! ordan S. Potash, PhD, ATR-BC, REAT, LCPAT (MD), LCAT (NY) is a registered, board certified and licensed art therapist, as well as, a registered expressive arts therapist. He has worked with clients of all ages in schools, clinics, and community art studios in the U.S. and Hong Kong. Jordan is primarily interested in the applications of art and art therapy in community development and social change, with an emphasis on reducing stigma, confronting discrimination and promoting cross-cultural relationships. Jordan has published on a variety of topics that include multiculturalism, social change, burnout prevention, ethics and medical humanities. He is also co-editor of Art therapy in Asia: To the bone or wrapped in silk (2012, Jessica Kingsley), the first book to systematically document indigenous, adapted and integrated art therapy theories and practices across Asia. Within the American Art Therapy Association, Jordan is the current chairperson of the Ethics Committee. In the past, he also served as chairperson of the Multicultural Committee, as well as, Book Review Editor for Art Therapy: Journal of the American Art Therapy Association. I have always been interested in the arts, but wanted to find a way to make use of the arts in the service of helping, community development and social change. I received my masters in arts (MA) in art therapy from The George Washington University in Washington DC following my bachelors of arts (BA) in psychology and studio art from Syracuse University in Syracuse, New York. I completed a doctorate in philosophy (PhD) in social work and social administration from The University of Hong Kong through the Centre on Behavioral Health, which specializes in holisitc practice by integrating Western psychology and clinical practice with Chinese philosophy, as well as, Traditional Chinese Medicine and health practices. My research focused on the application of art therapy as a means of promoting empathy for discrimination reduction and social change. Each of these trainings contributed greatly to my understanding of how to use art for cross-cultural dialogue and understanding. In particular my mentor Francis McMillan Parks at Syracuse University taught me the importance of community service, the philosophy of nonviolent resistance and strategies for intercultural dialogue. Outside of my formal training, learning about Joan Kellogg’s The Archetypal Stages of The Great Round of Mandala from Carol Thayer Cox has provided me with a foundation for making use of existential and Jungian concepts in my work. I am currently Visiting Assistant Professor in the Graduate Art Therapy Program at The George Washington University. My primary tasks include teaching courses in multiculturalism, human development, psychopathology, and research methods. I also advise students who are writing their culminating projects. In addition, I assist with departmental research and see clients in the GW Art Therapy Clinic. I honestly like all of the parts of my job and feel fortunate to be in a position with so much variability. Teaching allows me to stay current with the field while also engaging with students as they come to see where theories and practices sit within their own style of working. Research provides me with opportunities to contribute to the knowledge in our profession in order to continue demonstrating it’s unique contributions to the helping professions. Most importantly, working with clients and members of the community teaches me of the power that creative expression offers for developing self-understanding, learning about others and finding one’s place in the world. It’s difficult to pinpoint only one person. I am indebted to my professors and supervisors at GW, as well as, those at HKU. Francis McMillan Parks at Syracuse University provided me with a foundation and love for service, Cheryl Doby-Copeland demonstrated important leadership skills, Carol Thayer Cox taught me a framework for which to view the world, Rainbow T. H. Ho at HKU introduced me to intentional research and my colleague Debra Kalmanowitz reminds me to maintain critical awareness of our work. Art therapy is the use of the creative process and resulting art product to further understanding of one’s self, one’s relationships and one’s place in the world. The creative process allows for expression and communication, as well as, reflection and meditation. Intentional and careful exploration of the art product allows for insights and learning that can lead to new perspectives, necessary challenges and increased well-being. There are many opportunities for service to the community beyond the narrow confines of what we think of us clinical art therapy. I hope that PATA maintains a broad definition of art therapy that promotes practitioners to work across the health spectrum that includes wellness, prevention, and lifestyle management, as well as, therapy and rehabilitation. PATA recognizes Gioia Chilton, PhD, ATR-BC for Art Therapist of the Month! Gioia Chilton,PhD, ATR-BC is an accomplished arts-based researcher, art therapist and artist living in the Washington D.C. area. She began her journey as an art therapist in the early 1990s, earning her Master’s Degree at The George Washington University. Her professional career began at Saint Elizabeths Hospital where she worked with adult individuals with severe and chronic mental illness. Gioia learned much from co-creating healing moments with St. Elizabeths large expressive arts team and the individuals they treated. The cross-modal experience left quite the impression with Gioia so she pursued additional training in psychodrama. Her additional training led to her transition to working with adolescents at the Leary School in Prince George’s County. She combined art therapy and therapeutic theater to work with the teens, a blend she continued to explore with children in foster care and youngsters with emotional disorders in public school. In 2010, Gioia was the first person accepted into Drexel University’s new Creative Arts Therapies program. Her interests in art therapy, positivity, and healthcare led to her exploration of the expression of positive emotions in art making. She developed an Arts Inquiry for the basis of her study, in which five therapists used media such as poetry, art, stories and video to generate data. Gioia graduated with her Ph.D in March this year and finished her doctoral dissertation.